It’s basically a figure-of-eight pattern from Miami in the South ,then east to west up to Washington DC then east to west back to Miami.There’s about 3000 miles of driving and because of stopovers that works out at about fours hours per day. First we fly into Miami and drive North to Orlando via a stop at Fort Lauderdale where we might catch a bit of Sun on the beach. In Orlando we are going to visit some of the parks probably including “Disney Magic Kingdom”, “Disney Hollywood”, “Universal Studio” “Universal Island of Adventure” we’ll also head west o Kennedy Space centre”. Additionally we’ve also got tickets for “Disney’s Not-so-scary Halloween Night” (hopefully that won’t be too scary…). Then we head North up to Savannah where we we’ll grab some food in the historic sector and admire some of the huge plantation estates. Then we leave the coast for a week and head on a long drive west to the Great Smoky Mountains. We’ll spend a day exploring the world, avoiding the brown bears and enjoying the flora which causes the “Smoke” of the mountains. Then it’s a three day, 500 mile drive north along Blue Ridge Drive. Known as one of the best scenic routes in America, it twists and turns as it follows the summits of the Appalachians Mountains through awe-inspiring forests, wilderness and country side. The Blue Ridge drive eventually joins up with the beautiful Shenandoah National Park which we drive through up to visit the impressive Lurray Caves. Once done it’s back on the road to Williamsburg but not without a quick stop in Washington DC, our most northern stop. From Williamsburg we’ll visit James Town, the earliest permanently colonised town in America – where the English came and stayed and become American. Now it’s a drive south down the coast to Charleston via an overnight stop and a rest at the famous Myrtle Beach. Here we’ll be doing another Savannah visiting the old district and enjoying the old (for America) houses there. Then it’s south again with a stay over at Jacksonville, another restful lie on the beach and a drive along Florida’s west coast to Tampa. Here we’ve booked some great seats for a major league baseball game Tampa Bay Rays vs. Baltimore Orioles, including caps, hot dogs and gloves. 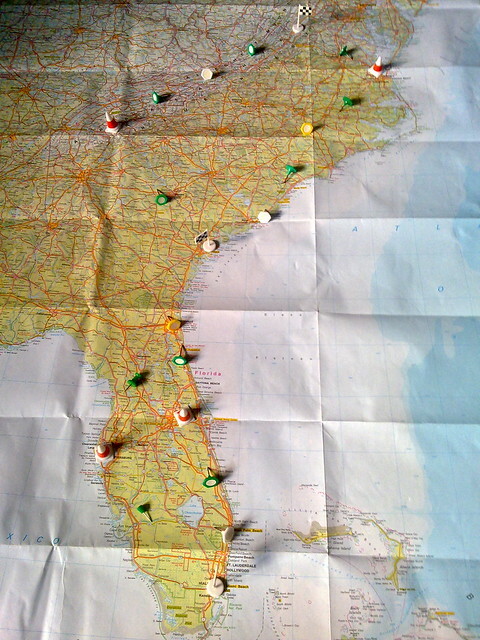 The final drive goes south, through the everglades and back to Miami for a couple of nights and hopefully a nice rest. &:-) I grabbed a book mark to this web page from Themelis Cuiper – search engine result advert top dog – so you must be doing a super job! BTW an address to this website at Themelis Cuiper’s SocialGarden Biz case studies of seo & marketing’s list of recommended web sites, you are doing an awesome job as he provides a bookmark to you!